The Chinese code of penal laws is compiled in such a manner as to have a punishment appropriated for every crime; a series of these is displayed in the following Plates. The wisdom of the Chinese Legislature is no where more conspicuous than in its treatment of robbers, no person being doomed to suffer death for having merely deprived another of some temporal property, provided he neither uses, nor carries, any offensive weapon. This sagacious edict renders robbery unfrequent; the daring violator of the laws, hesitating to take with him those means, which might preserve his own life, or affect that of the plundered, in the event of resistance, generally confines his depredations to acts of private pilfering, and a robbery, attended with murder, is, of course, very rarely perpetrated. This instance of justice, moderation, and wisdom, in the Laws of China, receives an unfavorable contrast in the decree, which pronounces the wearing of a particular ornament to be a capital crime; and in the custom of attending to the fallacious information, extorted by the Rack. Various writers have mentioned other punishments, in addition to those represented in this publication, of a much severer nature, which have been inflicted by the Chinese upon criminals, convicted of regicide, parricide, rebellion, treason, or sedition; but drawings, or even verbal descriptions, of these would be committing an indecorous violence on the feelings, and inducing us to arraign the temperance and wisdom, so universally acknowledged in the government of China. Exclusive of their novelty and information, the principal recommendations, possessed by representations of this nature, arise from the sensation of security, which they produce in those bosoms that heave upon a tract of the globe, where they are protected from being torn by lengthened agonies; where a person's innocence is not estimated by his mental or corporeal powers of enduring pain; where tyranny, fanaticism, or anarchy, cannot exercise their demoniacal propensities for cruelty; where capital punishment is only instituted and permitted as a necessary link in the chain of social order, to deter the evil-minded from committing outrages against their fellow-creatures, and to debar the offender from the power of perpetrating farther wrong. These intentions are fully answered by publicly depriving the malefactor of his existence, which is effected, in England, in a manner the most instantaneous and least sanguinary, that a compassionate people could adopt; and whose natural intrepidity is farther manifested by this attention to the pangs of suffering humanity. A Culprit before a Magistrate. A Culprit conveyed to Prison. A Culprit conducted to Trial. An Offender undergoing the Bastinade. Burning a Man's Eyes with Lime. A Malefactor chained to an Iron Bar. Punishment of the Wooden Collar. A Man fastened to a Block of Wood. A Malefactor in a Cage. Punishment of a Woooden Tube. Conducting an Offender into Banishment. A Malefactor conducted to Execution. The capital Punishment of the Cord. It is the custom in China, for a Mandarin of justice to administer it daily, morning and evening, in his own house, where he is attended by his secretary, or clerk, and by inferior officers, some of them bearing iron shackles, and others, pan-tsees. Upon his right hand stands the Prosecutor, or Informer; and before him is a table with a covering of silk, and the implements of writing for the secretary to take down the depositions and defence. These having been written in black ink, the magistrate signs them with red, and seals them with the same colour. On the table there are, also, a number of small sticks, tipped with red; these are kept in open cases, and are used in the following manner: if a culprit is convicted of a petty offence, the magistrate causes him to be immediately chastised, and released. The usual punishment, upon such occasions, is the pan-tsee, or bastinade, and the number of blows to be inflicted is signified by the magistrate's casting some of the above mentioned small sticks upon the floor: each stick denotes five blows. The culprit, who, during the examination, has awaited the decree upon his hands and knees, is then seized by the attendants, and punished as will be seen in a subsequent Plate. After the magistrate has thrown the sticks, he talks of other affairs, drinks his tea, or smokes his tobacco. It is only for trivial breaches of the Chinese Laws, such as drunkenness, cheating, squabbling, boxing, pilfering, insolence or inattention towards a superior, or the like, that any magistrate is empowered to administer punishment in a summary manner. Whenever the crime is of such a description as to call for severer notice, it is generally examined into by five or six tribunals, who not only require very particular information concerning the charge, but scrutinize with minute exactness, into the characters and manners of the accusers. Their proceedings in capital accusations are thus protracted in China, lest any man should be unjustly deprived of the inestimable benefits of honour or life: and no criminal can be executed, until his trial has been sent to court, and his sentence has been confirmed by the Emperor. An iron chain, fastened by a padlock, is put round his neck, and, if he refuses to proceed, inferior officers of justice compel him, after the manner described. He is preceded by a man, who strikes upon a gong, in order to draw upon the offender the notice of the public. Two others walk after him, one of whom is employed in keeping up his face with a bundle of cleft canes. A little red banner is fastened on each side of the culprit, to render him more conspicuous; and his hands are tied behind his back. He is thrown flat upon his face, and held in that position by one, or more, if necessary, of the magistrate's attendants kneeling upon his back, whilst another applies the pan-tsee to his posteriors. The pan-tsee is a thick piece of split bamboo cane, the lower end of which is about four inches in width, and the upper end small and smooth, to render the instrument more convenient for the hand. Mandarins of power have usually some persons in their train, who attend them with these pan-tsees, whenever they travel, or go into public, and who are ready, at the nod of their master, to exercise their office in the manner described. After this ceremony, it is customary for the delinquent to return thanks to the Mandarin, for the good care he takes of his education. He is held securely by two men, in the service of a tribunal, who are instructed to give pain, by a particular method of twisting the cartilages of the ears. This man is suspended by his shoulders and ankles, in a very painful situation: at intervals, two attending officers afford some trifling alleviation of his sufferings, by supporting him with a bamboo, passed under his breast. Pencil, ink, and paper, are ready, to note down whatever he may say. This punishment, together with the preceding one, is chiefly inflicted upon such merchants as have been detected in committing frauds, impositions, or any other unwarrantable tricks of trade. A species of correction appointed for boatmen, or, as they are termed in England, watermen. Having been convicted of some misbehaviour, he is compelled to kneel: one of the officers of justice prevents him from flinching, whilst another grasps his hair, and bestows a certain number of blows upon each side of his face, with a sort of double battledore, made of thick leather. A large piece of bamboo cane is placed behind his knees; this is trampled upon by two men, one standing on each end, and who convey more or less pain, as they approach to, or recede from, his person. A punishment, decreed against interpreters, detected of wilful misinterpretation. This horrible engine of barbarity and error is not peculiar to Roman Catholic countries, it is used even in China, for the purpose of extorting confession. The method of employing it, in torturing the ankles, is exhibited in this Plate. The instrument is composed of a thick, strong plank, having a contrivance at one end to secure the hands, and at the other a sort of double wooden vice. The vice is formed of three stout uprights, two of which are moveable, but steadied by a block, that is fastened on each side. The ankles of the culprit being placed in the machine, a cord is passed round the uprights, and held fast by two men. The chief tormentor then gradually introduces a wedge into the intervals, alternately changing sides. This method of forcing an expansion at the upper part, causes the lower ends to draw towards the central upright, which is fixed into the plank, and thereby compresses the ankles of the wretched sufferer; who, provided he be fortified by innocence, or by resolution, endures the advances of the wedge, until his bones are completely reduced to a jelly. This is effected by placing small pieces of wood betwixt them, and then drawing them very forcibly together with cords. It is frequently inflicted as a punishment upon disorderly women. There are no people existing, who pay so sacred an attention to the laws of decency as the Chinese; habituated in preserving the constant appearance of modesty and self-controul, nothing is more uncommon amongst them, than deleterious examples of unblushing vice; and if there be truth in the old maxim, that want of decency, either in action, or in word, betrays a deficiency of understanding, they certainly indicate more sense than some other nations, who affect to excel them in education and refinement. The general manners of people of every condition in China wear as modest a habit, as their persons. They discover no gratification in wresting their proper language into impure meanings; and grossly offensive phrases are only to be heard amongst the very dregs of the community, and at the risk of immediate and severe judicial correction. A small quantity of unslacked lime is put into pieces of cotton cloth, and closely applied to the organs of sight. A MALEFACTOR CHAINED TO AN IRON-BAR. His neck is encompassed with a very wide cape of iron, which is fitted to his shoulders; his legs are fettered with iron shackles, and from these, as well as from the cape, a few links extend to the bar, which is about half a yard higher than his head. The links, sliding upon the bar, accommodate themselves to the motions of the prisoner; the small piece of plank, that is attached to the shackles, serves him for a seat. From the top of the bar, there depends a little board, upon which the name and crime of the malefactor are inscribed. THE PUNISHMENT OF THE WOODEN-COLLAR. THIS punishment is deemed very disgraceful. The collar is formed of heavy pieces of wood, closed together, and having a hole in the centre, which fits the neck of the offender, who, when this machine is upon him, can neither see his own feet, nor put his hands to his mouth. He is not permitted to reside in any habitation, nor even to take rest for any considerable length of time, an inferior officer of justice constantly attending, to prevent him. By night and by day, he carries this load, which is heavier or lighter, according to the nature of the crime, and the strength of the wearer. The weight of the common sort of these wooden collars, is only fifty or sixty pounds, but there are those, which weigh two hundred, and which are so grievous to the bearers that sometimes, through shame, pain, want of proper nourishment, or of natural rest, they have been known to expire under them. The criminals find various methods, however, of mitigating this punishment: by walking in company with their relations and friends, who support the corners of the collar, and prevent it from pressing upon the shoulders; by resting it upon a table, a bench, or against a tree; or, according to the representation in the accompanying Plate, by having a chair constructed for the purpose, with four posts of equal heights to support the machine. When this ponderous incumbrance is fixed upon an offender, it is always before the magistrate, who has decreed it; and upon each side, over the places where the wood is joined, long slips of paper are pasted, upon which the name of the person, the crime, which he has committed, and the duration of his punishment, are written, in very distinct characters; a seal is likewise stamped upon the paper, to prevent the instrument from being opened. Three months is the usual time appointed for those to bear about this collar, who have been convicted of robbery. For defamation, gambling, or breaches of the peace, it is carried a few weeks; and insolvent debtors are sometimes ordered to bear it, until they have satisfied their creditors. When the offender is to be liberated from the collar, it must be in the presence of the magistrate, who has imposed it; he then generally orders him a few blows of the pan-tsee, and dismisses him, with an exhortation to comport himself more regularly in future. ↑ For similar relations of this punishment, See page 488, Vol. II, and Plate XXXI. folio vol. of Sir George Staunton's Account of Lord Macartney's Embassy to China. Also note to the description of Plate LVI. of Major Mason's Costume of China. ↑ See folio vol. of Sir George Staunton, Plate XXVIII. A MAN FASTENED TO A LARGE BLOCK OF WOOD. A strong ring of iron is passed through one corner of a short, heavy, piece of timber. From this ring, a weighty chain is continued round the neck of the man, and fastened, by a padlock, upon his breast. THIS person is farther secured by a chain from his neck to his ankle, from whence another chain proceeds, round one of the corner posts of his wooden cage, the entrance to which is through two moveable bars; these bars are fastened by an iron bolt, that passes through some staples, and is prevented from sliding, by a padlock. A plank serves this prisoner for a seat, and for a bed. PUNISHMENT OF THE WOODEN TUBE. A PIECE of bamboo cane is provided, which nearly corresponds with the height of the criminal, and is of considerable circumference. This bamboo being perfectly hollow, admits the passage of a large iron chain, one end of which is rivetted round a stake, the other encircles his neck, and is confined there by a padlock. His legs are fettered by a few links of chain. THIS punishment is reported to have been inflicted upon malefactors, who have endeavoured to make their escape. A vessel containing Chunam, a species of mortar, is at hand, to be applied, by way of styptic, to the wounds. It is said, that this punishment has been lately abolished, the legislature considering, that the natural inclination for liberty, merited not a chastisement of such severity. THIS criminal is fastened, at full length, upon a sort of bedstead, a chump of wood serving for a pillow. His hands and his feet are loaded with iron manacles and fetters; his neck is chained to a post, and fastened by two padlocks. A PERSON, sentenced to transportation, is thus led, by an officer of justice, into the country appointed for his future residence. He carries a mat to serve him as a bed, and a leaf of a palm tree, to protect him from the weather. Upon his back, his crime, his sentence, and his name, are displayed in conspicuous characters. This punishment is inflicted upon those, who have struck an elder brother; who have incurred debts by gaming, which they are unable to pay; and for such other offences as appear to render the perpetrator unworthy to continue in his native country. THE convict is fettered, and, if he uses abusive or inflammatory language, gagged. His arms are pinioned behind his back, and he bears a board, on which are written his name, his crime, and his sentence. If he hesitates to proceed, he is driven to the place of execution by some inferior officers of justice. THE usual capital punishments in China are strangling, and beheading. The former is the most common, and is decreed against those, who are found guilty of crimes, which, however capital, are only held in the second rank of atrocity. For instance, all acts of homicide, whether intentional or accidental; every species of fraud, committed upon government: the seduction of a woman, whether married or single; giving abusive language to a parent, plundering or defacing a burying-place ; robbing with destructive weapons: and for wearing pearls. It would not, perhaps, be possible to form any probable conjecture of the motive, which has induced the Chinese legislators to attach the pain of death to the wearing of a precious gem. The fact is, therefore, only stated from the information of various writers, and remains to be explained by some future commentator. Criminals are sometimes strangled with a bow-string, but on general occasions, a cord is made use of, which fastens the person to a cross, and one turn being taken round his neck, it is drawn tight by an athletic executioner. Men of distinction, are usually strangled, as the more honourable death; and where the Emperor is inclined to shew an extraordinary mark of attention towards a mandarin, condemned to die, he sends him a silken cord, with permission to be his own executioner. 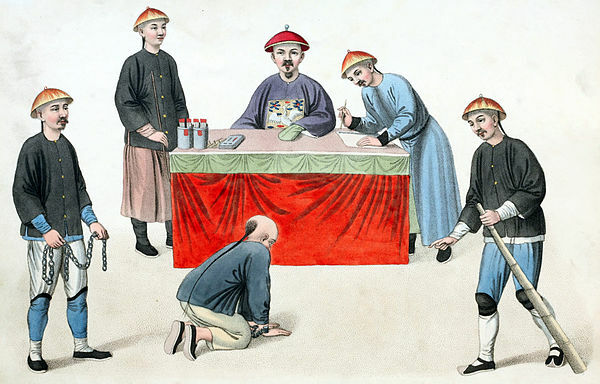 THIS sort of punishment, being deemed in the highest degree ignominious, is only inflicted for crimes, which are regarded by the Chinese government, as the most prejudicial to society; such as conspiracy, assassination, committing any offence against the person of the Emperor, or attempting the life of any of the imperial family; revolting, insurrection, striking a parent, or any other unnatural sort of crime. The malefactor, who is condemned to be beheaded, is made to kneel upon the ground, the board of infamy is taken from his back, and the executioner, by a single blow of a two-handed sword, strikes off his head with great dexterity. These headsmen, and indeed, the generality of inferior officers of justice in China, are selected from the soldiery, according to the custom of primitive barbarians; neither is this employment considered more ignominious, than the post of principal officer of executive justice in other countries. Decapitation is held, by the Chinese, as the most disgraceful kind of death; because the head, which is the principal part of a man, is separated from the body, and that body is not consigned to the grave as entire as he received it from his parents. If a great mandarin be convicted of any atrocious offence, he is executed in this manner like the meanest person. After the head is severed, it is frequently suspended from a tree, by the side of a public road; the body is thrown into a ditch, the law having deemed it unworthy the respect of regular funereal rites. When a sentence is submitted to the Emperor for his approbation, if the crime be of the first degree of atrocity, he orders the malefactor to be executed without delay; when it is only of an ordinary nature, he directs, that the criminal shall be imprisoned until the autumn, and then executed; a particular day of that season being allotted for such ceremonies. The Emperor of China seldom orders a subject to be executed, until he has consulted with his first law officers, whether he can avoid it, without infringing on the constitution of his realm. He fasts for a certain period, previous to signing an order for an execution; and his imperial majesty esteems those years of his reign the most illustrious and most fortunate, in which he has had the least occasion to let fall upon his subjects the rigorous sword of justice. Printed by W. Bulmer and Co. Russelcourt, Cleveland-row St. James's.